Follow us on youtube !!! Talks recorded during the 2015 Ring Meeting are now available. All talks are available to sponsors using their login credentials from the last RING newsletter. The Meeting introduction and best student presentation on channel architecture are available to everyone. A new application of L-systems to model channel system architecture and connectivity. (by Guillaume Rongier) BEST STUDENT PRESENTATION !!! 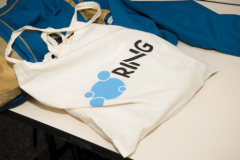 Follow this link and you will find all papers, presentations and videos related to the 2015 Ring Meeting.